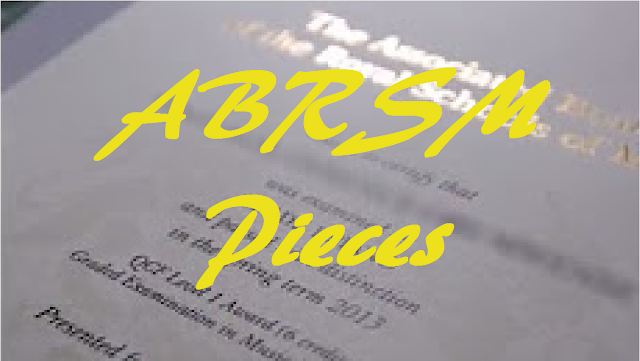 In order to get a good mark on your pieces in an ABRSM Exam, it is not just a question of getting the correct notes. That might be good enough to pass at lower grades, but at the higher grades there must be a sense of involvement when playing - communicating the mood, style and character to the listener. I think you'll agree that, although the first one was 95% note accurate and kept the pulse going, the second, had more expression, conviction and musicality. With this in mind, getting a good mark in an ABRSM exam, starts right back when you choose your pieces. You should listen to all the options available and then choose the one that inspires you. You will play a piece better if you enjoy it. The next step, is not to start learning the notes immediately. but listen to other good performances of the piece. make notes of how others interpret it, the shaping, the phrasing, the dynamics etc. Remember - you are a MUSICIAN not a TECHNICIAN. Then, if there are any particular technical difficulties, start practicing slowly. maybe with a metronome. If you are stumbling on a particular passage, you are playing it too fast. Don't try and run before you can walk. You'll find that slow methodical practice, gradually increasing the speed, will develop muscle memory, so that eventually you will be able to play it faster - effortlessly. On the other hand, if you start practicing too quickly, constantly making the same mistakes, you are reinforcing the habit of making those mistakes. It will be even harder to break that habit later. Once you have learned a piece, both musically and technically, you should be confident when going into the exam. Remember, one of the marking criteria for a distinction, was an "assured" performance. Go into the exam believing in yourself and when playing, you should have done enough preparation, that you can forget about the notes and enjoy the music. That's right, I said "enjoy" in the context of an exam. If you enjoy performing a piece, the examiner will enjoy listening to it.